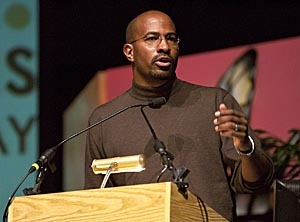 Van Jones will speak April 25 at UCSC. SANTA CRUZ, CA--The battle to save the planet could create an "eco-apartheid" unless low-income areas and communities of color get their share of new "green-collar" jobs, according to Van Jones, an Oakland-based progressive leader whose vision of environmentalism puts poverty, racism, and social justice at the fore. Jones will discuss the intersection of environmentalism and social equity on Wednesday, April 25, at 7 p.m. in the Colleges Nine and Ten Multipurpose Room at UC Santa Cruz. The title of his talk is "Growing Greener, Growing Together: Sustainability, Social Justice, and the Future of the Progressive Movement." Jones is a member of Oakland Mayor Ron Dellums's Green Economic Initiatives Task Force, which is championing the idea of aggressively attracting eco-friendly employment and businesses to inner-city Oakland. He is writing a book called "Green-Collar Jobs: How To Beat Global Warming, Cut Poverty & Unite America," in which he places the poor and the disadvantaged at the center of a new, solution-based environmentalism. He is the founder and national executive director of the Ella Baker Center for Human Rights in Oakland, which focuses on positive alternatives to incarceration and violence in urban America. "Van Jones is a powerful speaker with an inspiring, progressive message," said Manuel Pastor, professor of Latin American and Latino studies at UCSC and director of the Center for Justice, Tolerance, and Community, which is bringing Jones to campus as its eighth annual spring speaker. "He represents a new generation of leadership that has learned not just to protest but also to prescribe and the importance of building bridges between unlikely allies." Jones continues the legacy of the civil rights movement through steady and traditional one-on-one organizing while also embracing new tools, said Pastor, noting that Jones teamed up with MoveOn.org veteran James Rucker in the wake of Hurricane Katrina to create ColorOfChange.org, an e-activist community focused on black issues that is now the largest such online community in the United States. Jones also convinced organizers of the United Nations' World Environment Day to let the Ella Baker Center lead the first-ever "social equity track" at the 2005 Green Cities International Summit in San Francisco, where the center announced its new "Reclaim The Future" initiative. The Oakland Apollo Alliance is now northern California's biggest clean-energy jobs coalition, said Pastor. In 2002, Jones was named a "Global Leader of Tomorrow" at the World Economic Forum in Davos, Switzerland--three years after he was arrested in the 1999 Seattle protests against the World Trade Organization. He has served as a board member of the Rainforest Action Network and Bioneers. For more information, please call (831) 459-5743 or send e-mail to cjtc@ucsc.edu.